Nusa Lembongan, the small island between Bali and Nusa Penida in the Badung Strait, is a perfect hideaway for a holiday, uncrowded with visitors, offers unruffled beaches and serene blue waters. Overlooking Sanghiang Bay with its clear sapphire-blue waters, the Nusa Lembongan Resort offers a panoramic view of eastern Bali and the majestic silhouette of Mount Agung. Nusa Lembongan Resort provides our guests with private transfers on the luxurious 87 foot sailing catamaran SailSensations. 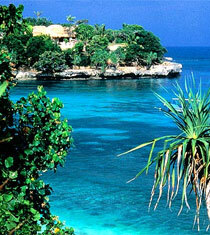 Enjoy a 60-90 minute motorized sail across the Badung Strait departing Benoa Harbour at 9am & Lembongan Island at 4pm. During the trip light snacks and drinks are provided.Alternatively a speed boat option is available upon request. Indo.com will also provide transfer to the Nusa Lembongan Resort with additional charge starting from USD 30 to USD 130 (return) and from USD 20 to USD 70 (one way). Please note: transfer to Nusa Lembongan should do the reservation first prior the arrangement and the transfer only take launch on the daylight. Whenever you arrived to Bali at night, you should stay a night on the land.